The State Commission of Public Services of Mexicali (CESPM) is a Decentralized Public Organization of the State Government of Baja California in Mexico. CESPM oversees the planning, construction, operation, and maintenance of the potable and wastewater infrastructure in the Mexicali municipality. The Zaragoza Wastewater Treatment Plant is the CESPM’s largest plant with a design capacity of 1,300 liters per second, or nearly 30 million gallons per day. The plant treats 55% of the wastewater generated by the city. The wastewater has unique and challenging aspects characterized by high concentration of sulfides which causes strong odors in the community. The odor is due to the long distance the wastewater travels in the underground sewage system prior to arriving at the WWTP, which in turn, causes anaerobic conditions at the plant. From 1971 to 2005, the plant was operating as a lagoon system with sequential anaerobic, facultative, and maturation lagoon processes. In 2005, the rehabilitation and redesign project began with the objective to eliminate the anaerobic conditions and diminish the emanations of Hydrogen Sulfide (H2S) causing foul odors. Additionally, there was a need to improve the overall efficiency of the process and improve effluent water quality. In January of 2006, the CESPM formally restarted the operations of the Zaragoza WWTP with a lagoon system that included pretreatment and three aerated, partial mix lagoons. 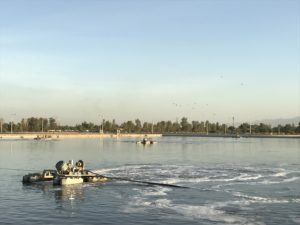 CESPM enlisted the help of Aeration Industries International and eight 30hp AIRE-O2 Tritons® were recommended per lagoon to improve effluent water quality. The Tritons were incorporated into a total of three lagoons. Following the aerated lagoons, the water is treated further in sedimentation, facultative, and polishing lagoons and, lastly, it is disinfected with chlorine gas dosing. During the original rehabilitation process it was not possible to acquire enough process aerators/mixers . 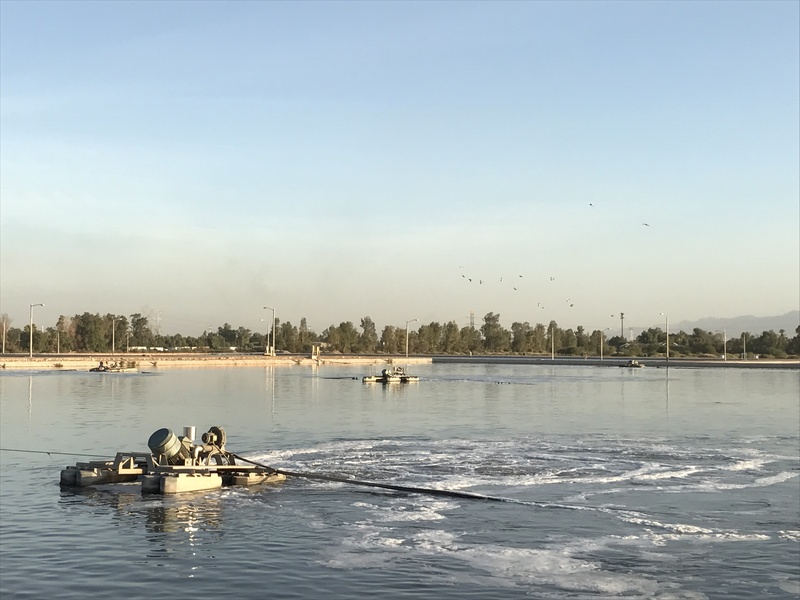 This resulted in zero residual dissolved oxygen in the effluent of the partial mix lagoons, causing an aggressive environment that provoked the deterioration of the electromechanics and foul odors noticeable both inside the plant and in the surrounding community. The only way to reduce foul odors was to oxidize the H2S with the installation of additional aeration equipment. After positive prior experiences with AIRE-O2 Tritons® at the Zaragoza WWTP and six other CESPM plants, the decision was made to install an additional nine 50hp AIRE-O2 Tritons® in 2015. The overall installed aeration and mixing increased by 38%. The new aeration and mixing system at the Zaragoza WWTP consists of a total of thirty-three AIRE-O2 Triton® process aerator/mixers that deliver the oxygen required to oxidize the H2S; eliminating the foul odors. After many years of foul odors emanating the Mexicali-Tijuana highway and community, the foul odors were finally eliminated thanks to the new aeration and mixing system. The plant has stopped receiving complaints from the community, residual dissolved oxygen levels are up to 3mg/L in the partial mix lagoons and up to 8.5mg/L in the final effluent. With the H2S no longer plaguing the plant, there has been an elimination of the cable and electrical sulfation in the MCCs and air conditioners, as well as protection for all the plant assets. Lastly, there has been improvement to the treatment process allowing for 37% of treated effluent to be used for industrial activities, 27% for agricultural, 1% for irrigation, and the remainder is discharged into the International Drain where it complies with the national environmental standard NOM-001-SEMARNAT-1996.